FIVE Condos scores serious Toronto heritage points with their unique "Yonge Collection"
It wasn’t that long ago that we paid a visit to the new FIVE Condos sales centre, conveniently located right beside the construction site of the new development at 5 St. Joseph. We were especially blown away by FIVE‘s Yonge Collection — a group of 14 suites in the restored heritage buildings on the corner of Yonge and St. Joseph. It wasn’t long before our curiosity got the better of us and we NEEDED to see how things were progressing with construction at the FIVE site. We hopped in the BuzzBuzzMobile (patent pending) and cruised on over to the sales centre and site to check up on things. Naturally we had our trusty camera with us, so have a look at the photos we snapped at the site of this awesome project by Graywood Developments and MOD Developments. Okay… We didn’t take this photo as we don’t have a time machine and most of us weren’t alive in 1977. 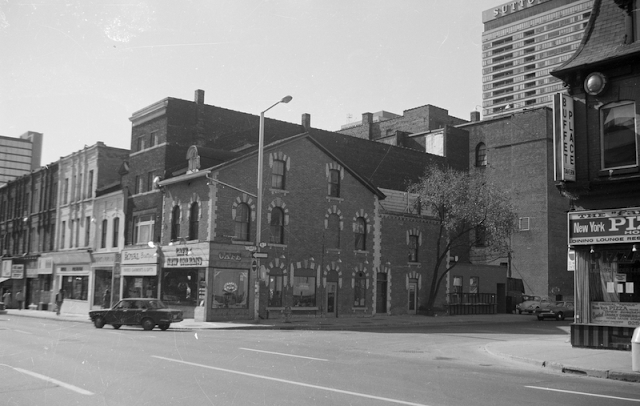 This is the Yonge and St. Joseph intersection in ’77. We thought it was interesting to put things into perspective and to see just how hard the developers are working to maintain the classic feel of the block. Here’s a look at the scale model. This is what the Yonge Collection will look like once it’s restored and turned into a fully functional condominium. Another view of the scale model. Construction is well underway at the site. Once complete, FIVE will soar 45 storeys into the air. Suite sizes start at 498 square feet and top off at 1683 square feet. Crews working on the Yonge Collection are restoring the facades to their original look. 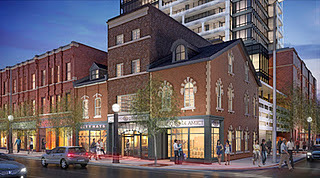 For more information on FIVE Condos, call 416 928 0555 or email info@fivecondos.com. The development’s website is also a simple click away.